It’s always a pleasure to enjoy many of the activities Ghent offers for adults and children: museums, theatre performances, sports, concerts and other exciting events. But did you know that with a special Out-in-Ghent card (UiTPAS) you can save points at each of them, and use the points to get a discount for your next ticket or a freebie? The Ghent pass UiTPAS, a part of the Flanders-wide UiTPAS initiative, is a simple plastic card that you can purchase from the city of Ghent. It costs between 1 and 5 euro, depending on your age and circumstances. You can find the addresses & opening hours via this link. You collect points when you visit a participating event or venue. You can recognise these venues by the blue-purple card reader they have at their entrance or ticket desk, while some of them also have an UiTPAS logo and info on their website. UiTPAS is available for all residents for Ghent, but also for people from outside of Ghent. So you can buy it even if you live in Merelbeke or Lochristi. However, if you are a tourist and visiting just for a few days, consider choosing the CityCard Gent instead. This gives you access to the city museums and public transport for 48 or 72 hours. If you are entitled to reduced doctors’ fees (verhoogde tegemoetkoming) or are in a debt restructuring programme, you can buy the special ‘UiTPAS met kansentarief‘. It costs 1 euro and gives you an 80% discount on entrance tickets for all participating venues. This special card can only be obtained from the Stadswinkel, the mobile city hall service (Mobiel Dienstencentrum) and the Campus Prins Filip infopoint. UiTPAS met kansentarief is issued only to residents of Ghent. Use the card by swiping it against an electronic terminal at each venue to collect points. Each activity will give you 1 point. You can only add points when you actually come for the event, not when buying the ticket. Instead of carrying the UiTPAS with you, you can also download the free app which you activate with your UiTPAS number. To collect points, simply scan the QR at participating venues. To have an overview of your account and see how many points you have managed to save, register your card online. The full list of participating venues is published and regularly updated on the Uit in Gent website. 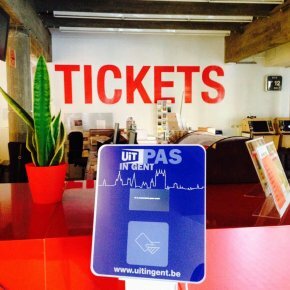 Do you have a favourite UiTPAS venue in Ghent? Or have you found a great way to redeem your points? Let us know in the comments below!